After 284 turns, the Confederate leadership determined that the fall of Richmond could not be prevented without great loss of life and destruction of material properties; hence, orders were issued for an immediate evacuation of the Capital. In effect, the Confederate players agreed to capitulate, despite a technical draw showing on the scoreboard. The reason being that MG Burnside's Corps, under cover of darkness, had successfully managed to "bridge" the Chickahominy River northeast of Richmond. The Yankees also established a grand battery overlooking their two crossing points and blasted the staunch Rebel defenders out of their entrenchments. 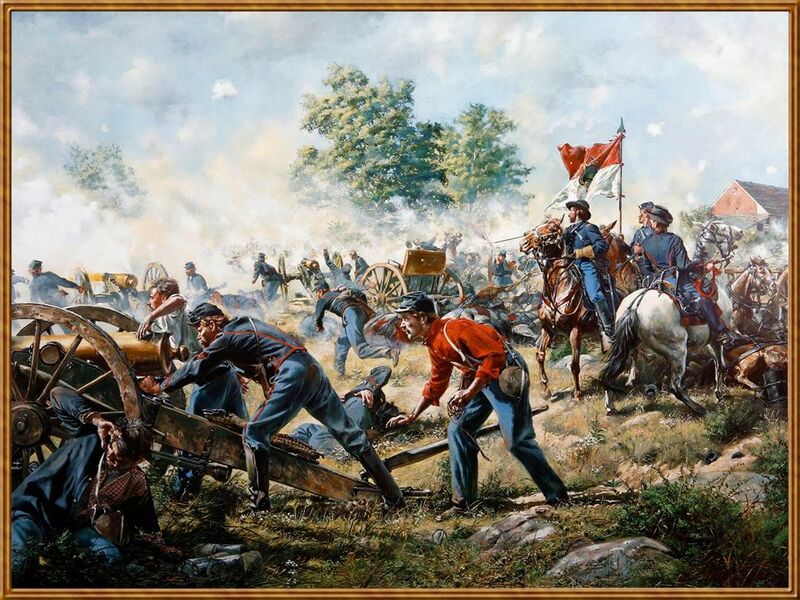 Tthe Rebels had insufficient forces in the northeast to adequately man the inner defensive works, so once the Union bridgehead was established, there was little to keep the Yankees from marching to the city environs. The Confederate team considered a last stand defense within the city limits but calculated that a defeat was inevitable given the Yankee numerical superiority. I will let other players add their own details, but I personally found the campaign to be challenging but enjoyable. I began as a replacement player on the Union side commanding Hancock's second corps and saw some action in the North Anna area. Later, I volunteered to play on the rebel team after a manpower shortage. Under Gen. Lee, I commanded Longstreet's Corps, which was given the defense of the northern section of the Richmond defenses, as well as the defenses along the Chickahominy River. In the north, Longstreet built a very strong set of works but his manpower was insufficient to fully man the defenses on the lower sections of the river. There, the crossing were mostly guarded with a regiment or two of home guards or cavalry supported by a few guns. Breastworks and trenches were prepared at the crossing points but these could not stand up to the near point blank pounding of the massed Union artillery when dawn came. Lee's other two corps were strongly entrenched on the western side of the city where the Yankees had launched an abortive assault the previous day. It was a great campaign. My thanks to Ken Miller (Union) and John Dragan (Rebel) for serving as army commanders, determining strategies, issuing orders, and finding replacement players for the 2 1/2 year campaign. And thanks to the many players on both sides who persevered throughout and fought the good fight until the end was clear. This game actually started in December 2014. Originally it was a test of an update to the Campaign Scenario John Ferry developed with John running the yanks. Eventually I ended up taking over command of the yanks and John Dragan commanded the rebels, we are the only ones of the original group who made it through the entire game. The game actually went through so many players that John and I decided to close the initial registered game as a draw and start a second one in the DoR so we could credit the newer players with turns played. After I decided to take a break and go on the Retired List there was no one interested in taking over the yanks so I continued as CinC so the other players could finish out the game. I'm not even sure if everyone who was involved got put on the registered game as I didn't think to check before retiring and I no longer have access to the DoR. If anyone was missed please accept my apologies. The Co's ran the night turns so we normally got through them pretty quickly and overall we averaged better than 2 turns a week which is pretty good considering there were 4-5 players per side. The original rebel group elected to retreat to Richmond and dig in along the river lines. I realized that trying to cross the rivers would be tough since a hex with breastworks and trenches is immune to fire unless you can get a modifier for flank/rear or column. This would allow the rebel guns to raise havoc with our advancing infantry, so I elected to try an attack on the right in the woods between the Deep Run Turnpike and the Westham Plank Road. This would reduce the ability of the rebel guns to cause heavy casualties and the attack by 2 & 6 Corps actually broke through the trenches and advanced well into the woods and the intention was to move towards the James and cut off the rebels in the trenches along the river but bogged down due to fatigue and routs. On the May 9 night turn, 9 PM, the yankees had 80 of 100 units rout and ended up back at the trenches by morning. Fortunately I had left Burnsides Corps moving on Chickahiominy River flank and they arrived at New Bridge just before night, rebuilt the bridge there and the unnamed bridge upriver and were able to cross the river with the help of their artillery and the 3rd Brigade from the reserve. Apparently our attack on the other flank had drawn so much of the rebel strength that they had not been able to complete trenches and breastworks here. With Burnsides Corps and Gregg's and Chapman's cavalry divisions in position to cross the river the rebels elected to call it a game. My thanks to all who took part as this was a major effort for all involved. Impressive task, congratulations to all participants. I hope something can be pulled out to improve this monster scenario, especially with the new victory conditions that are added with the latest patches and that surely will get to Overland too. These might solve the problem of the Rebels retreating to Richmond early. "...might solve the problem of the Rebels retreating to Richmond early." I don't understand. That is probably the only chance that the Rebs have to win this scenario and it is very difficult to even achieve a successful retreat to Richmond. Once there, the current Richmond entrenchments are too long for the number of Reb troops available and so a new shorter inner line of entrenchments and breastworks have to be built while also holding off the large Union Army. So why take away the best chance that this game has of being a competitive game. Guess that it evolves into the historian vs gamer aspects but competitiveness increases playability. And by the way, I didn't intend to be a party pooper. Congratulations on the teams for playing such a long and difficult MP game. It is also typical for Ken to show such devotion to duty. We salute all who participated in this MP game. It's not about taking the Confederates something away. Currently the scenario seems to go ahistorical right away as there is no need for the Confederates to defend any forward positions. But falling back also doesn't work as you point out that the Richmond defenses are too long. There is a reason that they only got to turn 284. Now with feedback and the new "Variable, Asymmetric, Turn-Based Victory Points System" that will surely reach Overland too, the real Overland campaign could be recreated with the Confederates not falling back right away. Congrats to all who fought so hard on this one! I am truly in awe of those who play these (or any MP's for that matter). I have always wanted to play them but don't have the time nor the playing habits to sustain doing one, so I am always impressed when folks do. This was a long one and had a lot of folks involved. If any officers who need to be credited, have't been let me, General McOmish, General Riggs or General Meyer know and we'll take care of it. Ned said "It is also typical for Ken to show such devotion to duty" and I agree! Both Kens for that matter. One comment though, Burnside's Corps.....really! Who would've thought..... You Yanks were lucky to get one up on Ol' General John Dragan! In a separate game, the Rebs just won this scenario in 303 turns by falling back on Richmond. Forcing the Rebs to attempt to duplicate the historical Overland Campaign is not going to be a competitive game and will probably result in it not being played much. When the time comes, maybe they can do one your way to satisfy the historians in the club and do one my way to satisfy the gamers. This one can be a great scenario but both sides need to be capable of winning in order to accomplish that. It would be interesting to hear how the MP gamers handled the replacement pool, per the instructions or were some adjustments made. For example, if you play without the Arty Capture option on, then a battery destroyed just disappears and sometimes the player has no idea who just got eliminated, thus not knowing which replacement battery to bring on. Also keeping up with the loss percentage for each unit can be exhaustive as well as trying to keep up with who can come on when on the Union side. We adjusted those rules to make the game easier to play but our adjustments would make a historical type player pull their hair out. Wonder how the Confederates achieved that. Anyhow, wanting a competitive scenario is usually the request for a What-If version, in warfare no commander wants a competitive battle, he wants to have the advantage on his side and most often that is achieved. As the campaign is supposed to mirror the historical situation it would be important to finally get to that point, that doesn't mean to force the situation with no elbowroom but at least it should develop in a reasonable way along the historical course of action. If that is achieved one can make as many What-If scenario as needed based on the correct historical scenario. Some folks seem to have missed the point. This big scenario is historical only in that the forces avalaible to both sides at the beginning of May are accurate and reinforcements appear when they were historically available. The starting positions are historical. After the start though, this is a wide open game. How can anyone expect it to follow a historical path? The scenario will play out according to the player’s choices. I don’t think the conclusion is preordained in any way. True, the Union has a big numerical advantage but that is historical. Maybe the consecrates can be given an entrenching bonus but what else would make it competitive besides more men? If I am the Union side the "path" it follows depends on how fast the Rebs can run south. It has been a while since I played it but my general impression was that the Union side had to high a morale. While they probably did start out that way they quickly deteriorated as the three year men left the ranks and conscripts filled them.. This is hard to reflect in the game since there is no easy way to "age" existing units morale over time. This deterioration of the Union army is why you start seeing things like Jerusalem Plank Road where a few understrength CSA brigades can drive entire Union Corps back inflicting 4-5 times the casualties. I have played this campaign two times before and I am currently playing it against Brett Kolcun. The first time was against Joe Meyer, who beat me soundly in 163 turns, the second time was as a ring in for the last quarter of the MP game being discussed here. Based on my observations it is a tough ask for the CSA to beat the Union in open battle due to the fact that the psychological aspects of the leaders are hard to recreate, plus each side has a good understanding of each others strength and capability. For the battle with Brett I got agreement to alter things to un fix all units and to alter the entry points of reinforcements so these aspects do not dictate what happens in the campaign. Having 2000 or more men and some guns fixed in the middle of the battlefield until the union shows up is not realistic. So far I have tired to isolate and attack part of Brett's army, but the Union reinforcements just kept coming and I was close to having a Corps cut off and done in. How Grant did not take Richmond in 1864 is beyond me, but as for my current battle with Brett RICHMOND SHALL NOT FALL. hopefully We are currently on turn 168. Grant didn't take Richmond in the 64 Overland Campaign for a lot of reasons. Some his own fault or that of his subordinate generals. Grant didn't know how to use cavalry which odd because his Vicksburg Campaign was a success because of how he handled his cavalry. Meade was to defensive minded to beat Lee in a tactical battle. Sheridan was an over inflated ego that didn't know what a horse was for. Burnside was Burnside. Corps level it was a mixed batched but since the higher command didn't coordinate them it didn't much matter. But there were a lot of other factors that a single scenario campaign game can't include. The deterioration of quality has men left the ranks and were replaced with draftees. The logistic tail that had to be maintained and defended by the Union reducing both the number of front line troops as they moved south and forcing the army to move only by certain lines of attack. The Union player only has one problem. Trying to get the CSA player to stand in one spot long enough to bring his overwhelming forces to bare on him. If the Reb player ever stops long enough for the Union to start his columns around the flanks, he will be surrounded and killed to the last man. Taking Richmond becomes a minor operation after that. I haven't played anyone who just picked up and ran for Richmond from day one. I don't know if there is a line that they can form with enough density it can't be broken but still covers the critical objectives. But if anyone has the time to make this scenario work (fast email turn around a must) I will gladly show them what the Yankees can do to them. I have won this scenario as the Reb but it takes almost a miracle to do. Something like the Union leaving a Corps somewhere you can surround it and wipe it out before they can get support too it.